Just pay for what you use. No waste. This is an advanced era in construction technology. Mixed concrete is considered as the backbone of the construction. It is not a time of brick and mortar. Nowadays walls, pillars, and foundations are being built with cement concrete ”A HOMOGENEOUS MATERIAL“ for durability, strength, quality and quick service. Mixing concrete is a technology along with special skills. Small home mixture machine cannot provide you the same quality of mixture throughout the production. We supply ready mix concrete, onsite concrete by mixing it at your site with a computer calibrated mixture. While we mix ready-mix concrete we care for your needs, quality, and quantity that you need. This is why we grantee that no wastage and "Pay for what you use". Construction concrete is one of the important building materials. 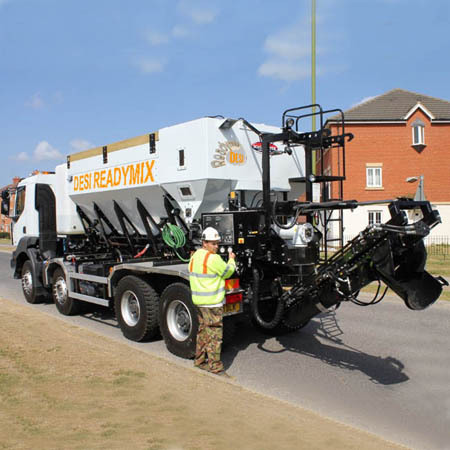 Desi Ready Mix Concrete Limited is a concrete supplier company / concrete contractor company which is responsible for providing you best ready mix concrete, onsite concrete in London, Slough and surrounding area. Our experienced and professional team help you to choose right mixture and provide you On-site concrete / On Site Ready Mix Concrete at the time you need it. We serve clients all over the London including Reading and Luton area. Onsite concrete is a our client focused enviornment friendly service. Our this service is very similar to ready mix, just the difference is onsite concrete is being mixed on the site so only the needed quantity would be mixed No wastage and the ready mix concrete is mixed at supplier’s yard and the ordered quantity would be supplied. It might be the somthing less than the actual required or more than the required quantity. Desi Ready Mix Concrete Limited is a concrete contractor company also provides computer calibrated mixture machine, raw material and concrete pump at your doorstep. All services are tailored to your needs. Our professionals guide you to select the right materials and target to the time span that you need at your job location. Minimum order of concrete we accept is 1m3. We provide concrete on demand and ensure no waste. A standard concrete mix is available at your site. We also supply concrete pump to support our clients to transport the concrete on narrow places or higher floors of a building. The concrete pump hire service is a tailored for clients. Just fill the form at contact us for more information or an offer. Our services area is all over London and surrounding areas such as Harrow, Stanmore, Edgware, Watford, Harefield, Wembley, Uxbridge, Southall, Hayes, Hounslow, Kingston, Langley, Reading and around.